Queen of Pop Lady Gaga is all tears after tying for Best Actress with Glenn Close at Critics' Choice Awards. 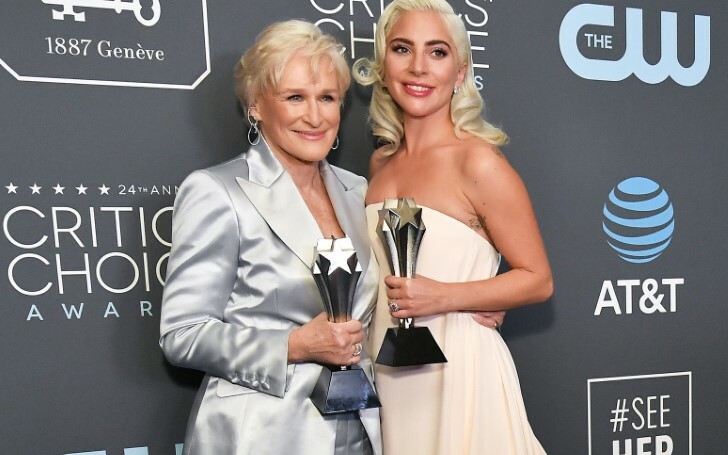 On Sunday, 13 January, Lady Gaga and Glenn Close both won the title for Best Actress at the 2019 Critics’ Choice Awards. Gaga received the title for her performance in the movie A Star is Born and Close was recognized for her role in The Wife. Lady Gaga and Glenn Close both were emotional as they accepted the award for Best Actress. The Wife actress Close was the first to be announced and was “thrilled” to have tied with Lady Gaga. Later, in her acceptance speech, she celebrated her success with everyone present there before Gaga was announced. When the 32-year-old singer took the stage for the second time after accepting the award for Best Song for “Shallow” earlier in the evening, the singer was utterly shocked and in tears. She, however, couldn't be prouder to share the stage with her fellow winner. Upon accepting the Award the Shallow singer, burst into tears and thanked Bradley Cooper who she described as a "magical filmmaker and human". Following the speech, the actor turned singer revealed her mother and Glen are very close friends whom she feels honored to share the stage with. It, however, wasn't the only tie of the evening as Amy Adams and Patricia Arquette both won Best Actress in a Movie Made for TV or Limited Series. Other big winner included Netflix's Roma, which took home Best Picture. Gaga and Close received nominations alongside actresses Emily Blunt, Toni Collette, Olivia Colman, Melissa McCarthy and Yalitza Aparicio. Earlier, Gaga's role in A Star Is Born was also nominated for the best performance by an actress in a movie drama for the Golden Globe award which she lost to Glenn Close. However, she won Golden Globe awards for her standout track Shallow from the same movie.